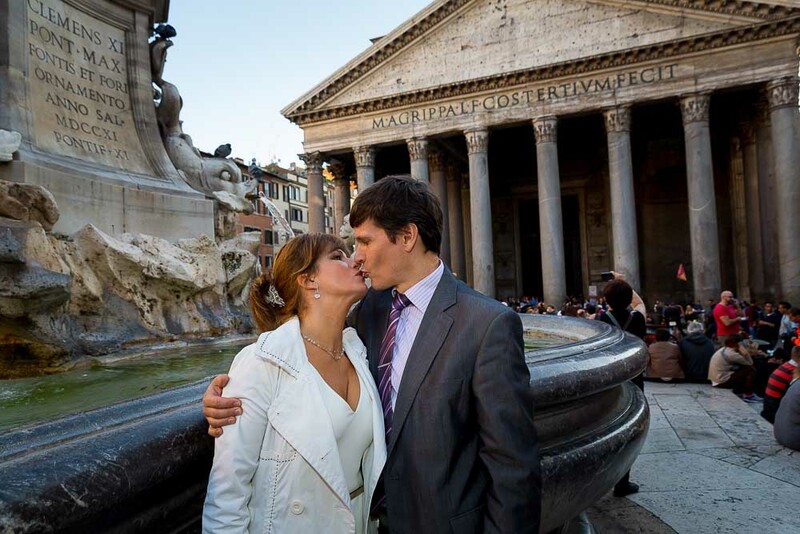 We made acquaintance at the Priam Hotel in downtown Rome where we began this wonderful photo tour. Our first location was the Roman Colosseum. We were actually dodging around a demonstration taking place in the center of the city. So we switched around locations a little bit. The sun was just fantastic shining behind the landmark. It just needed to be counterbalanced a little bit with some external light. Once we got the right pictures we moved on to the next destination. Was the best choice to follow. 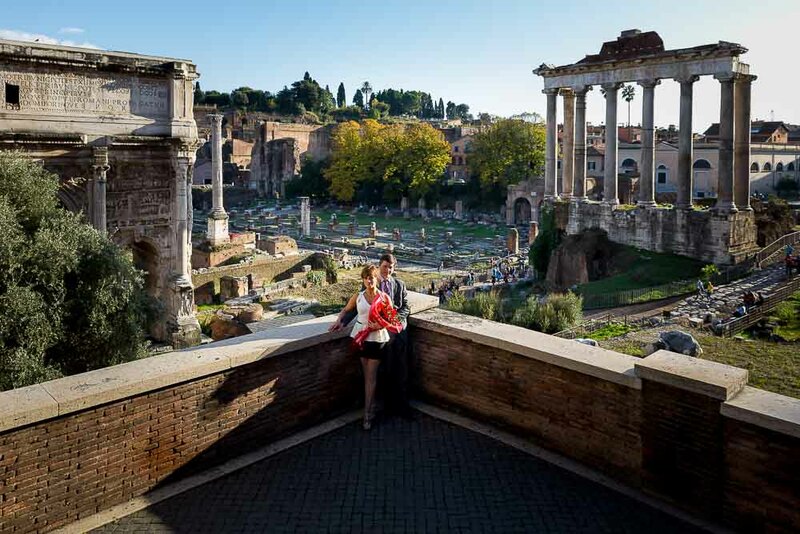 With stunningly beautiful views over the forum and ancient Rome. Providing a great panorama over the ruins as well as unique portrait opportunities. Like posing next to ancient marble statues or underneath roman porticoes shooting in between columns. They even pulled out a bright red carpet for us! Which matched the wonderful red roses as well as Alex’s red socks! This was our next site of choice. Concentrating first on taking pictures at the base of the large massive columns which so characterize the ancient structure. Then we tried catching the right moment to take a portrait shot with the light shining through the hole above. We took the finals photos just outside the Pantheon. In the main square and next to the water fountain. This was our last destination, photographing the beautiful fountain facade as backdrop to our engagement session. Then we crossed the street and included panoramic views over the city rooftops. 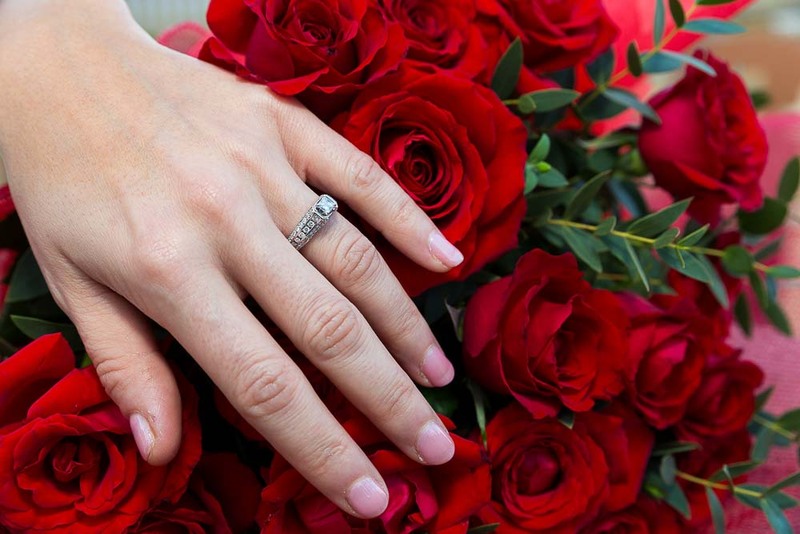 The photo tour ended with a final image of the engagement ring photographed over the red roses and a limo car transfer service back to the Hotel. Celebrating an engagement on a couple photo tour around the city. A photographic journey around the most impressive landmarks taking beautiful photos. Thank you for excellent job! We highly recommend Andrea to capture your special occasion. Andrea was a very professional and pleasant photographer! Our driver provide a wonderful experience of city and comfort .. Every person who has seen pictures has commented that they have amazed by beautiful view of Rome and this work of art… We had unforgettable time and felt very special!